Millers came from across the country to learn about Colvin Run Mill. 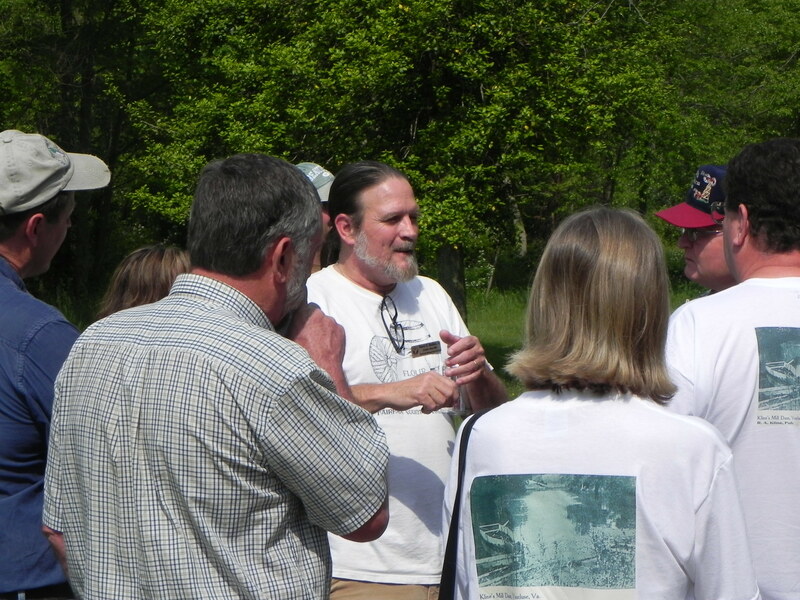 On a muggy morning in early May, a dozen millers from six states gathered around Mason Maddox at Colvin Run Mill Historic Site to learn about the historic gristmill. Maddox, the site’s miller for the past 15 years, shared his intimate knowledge of the mill with the group which was in town for a two-day workshop on running and preserving antique gristmills. This was the third consecutive year Colvin Run has hosted a Society for the Preservation of Old Mills (SPOOM) workshop. The comprehensive class, billed as “All hands-on. No lectures!”, covered operation of an overshot water wheel, milling on horizontal stones, handling and cleaning grains, packaging, storage of grain and milled products, lubrication, cleaning/housekeeping/pests, conducting tours and interpretation, safety precautions, grits separation, milling on a Meadows Mill, belting machinery and belt splicing, and wooden gearing/machinery. Attendees earned credits toward SPOOM Miller Certification, which verifies their expertise in the craft of operating antique mills. Miller Mason Maddox discusses the inner workings of the mill. In his laid back, friendly manner, Maddox spoke with enthusiasm about the mill and shared anecdotes from his experiences over the years. Attendees listened intently and asked questions and pointed out similarities and differences between Colvin Run Mill and their mills. Gary Hobbs, a miller from Beck’s Mill in Salem, IN, noted that his mill uses a pitchback water wheel (the wheel rotates in the opposite direction as Colvin Run’s wheel) and uses under runners (the bottom stone turns while the top stone remains still). Colvin Run’s overshot water wheel was built of oak in 1970 to reproduce the water wheel that powered the machinery in the c. 1811 mill. “I’m more interested in the grits,” stated Hobbs, as he explained that his main reason for attending the workshop was to find out how to increase grits production. 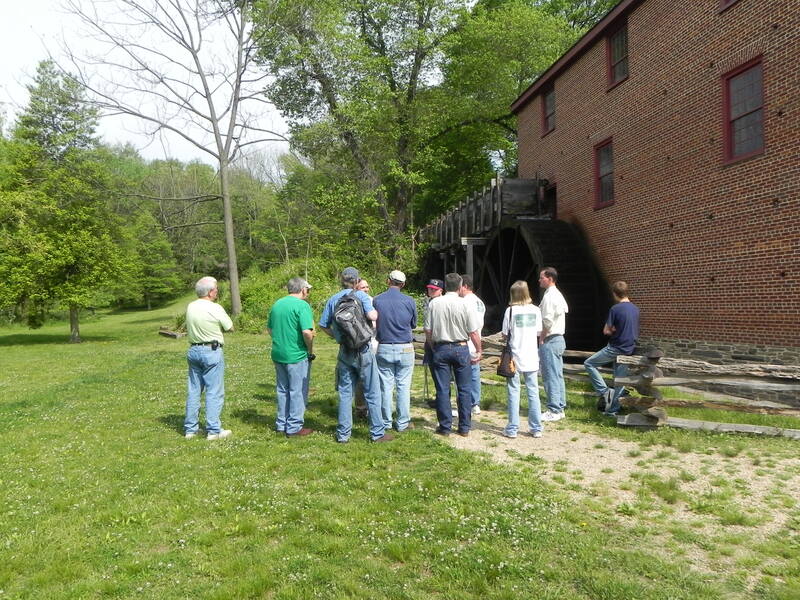 No matter why the millers came, they left with a better understanding of Colvin Run Mill’s inner workings and how the Fairfax County Park Authority interprets the site for the public. Colvin Run Mill is a restored c. 1811 gristmill. Colvin Run Mill Historic Site is listed on the National Register of Historic Places and is a Virginia Landmark. The park also holds a Historic Mechanical Engineering Landmark designation from the American Society of Mechanical Engineers. The public may attend grinding demonstrations from noon to 3 p.m. on May 20, June 3 and 17, July 1 and 15, and August 5 and 19. 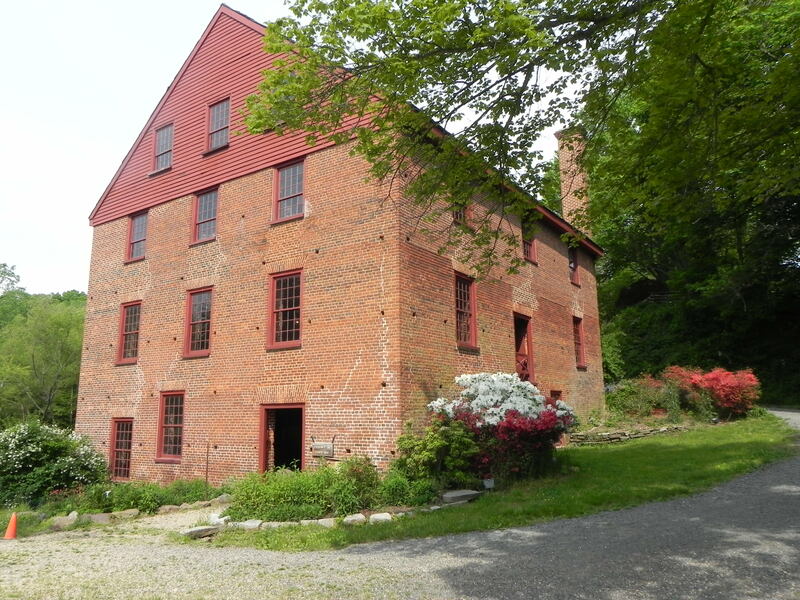 This entry was posted in Uncategorized and tagged American Society of Mechanical Engineers, Beck's Mill, Colvin Run Mill Historic Site, Great Falls, Gristmill, National Register of Historic Places, Virginia Landmark on May 11, 2012 by Fairfax County Park Authority. We can’t begin to express how much we enjoyed the milling workshop. And Mr. Maddox is as much of a treasure as the mill itself.